6 p.m. to 7:30 p.m. *Please note the extended timeframe for a reception and related special events! 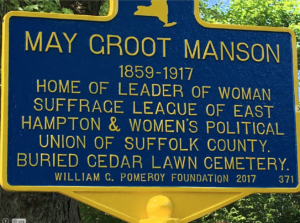 To celebrate the November 2017 one hundredth anniversary of the granting of the vote to the women of New York State, author Antonia Petrash will discuss the suffrage movement on Long Island and Arlene Hinkemeyer will focus on the suffragists of the East End, including Mrs. Thomas L. (May Groot) Manson of Main Street, East Hampton. 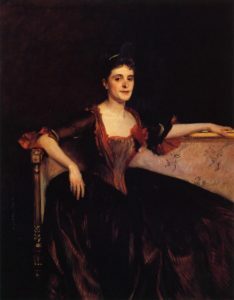 Her John Singer Sargent portrait is at left. Check out our suffrage exhibition in the Tom Twomey Gallery and the multimedia work of the Library’s young adult team as they bring the local women’s suffrage story of a century ago to life. This event is co-sponsored by the League of Women Voters of the Hamptons, the Town of East Hampton, and Hugh King, East Hampton Town Crier and Village Historian. Antonia is author of Long Island and the Woman Suffrage Movement and president and founder of the Long Island Woman Suffrage Association, Inc. The retired director of the Glen Cove Public Library, she is also the author of three other books about women’s history and continues to lecture and write about the woman suffrage movement at libraries, historical societies and schools. Arlene is an historian and a publicist who has worked for publishing companies in Chicago and New York, researching/writing history textbooks and has served as the historian of the Village of Plandome Heights, Manhasset, researching/writing that village history. She began researching the Suffragist leaders of the East End when members of the Hamptons League of Women Voters, dressed as suffragists, were preparing to march in East Hampton’s 350th anniversary parade in 1998.